We find ourselves introduced to a foundational folktale thanks to the stunning illustration by Kureha Rokuro commissioned for a 1943 publication, The Gods of Japan—Nihon no Kamisama, 日本の神さま. 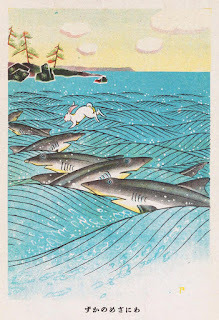 The titular hare of the ancient account, a tale in the origin saga of Japan, who tricks snarks—by appealing to their vanity—to line up for roll-call while the hare bounds over them (counting off as he goes, the sharks sure that the membership of their clan outnumbered that of the population of confined hares) as a bridge to get from the isolated island of Oki to the Hakuto coast, home of present day Tottori. 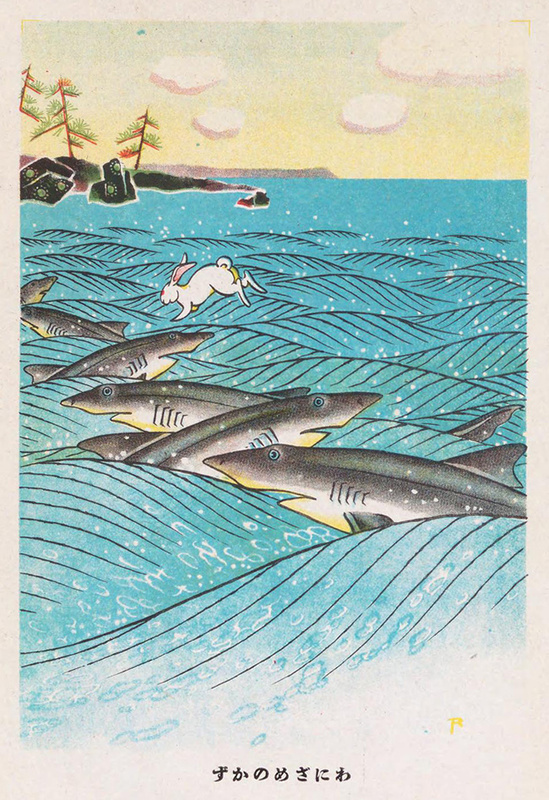 The hare boasts that he has deceived the dumb sharks as he nears the end (possibly the entire rabbit tribe had used this bridge to evacuate the island) and the last shark lashes out at him and rips off his pelt. Bereft of his fur and quite uncomfortable, the hare entreats a passing column of eighty brothers on a courtship embassy to compete for the affections of the Princess of Inaba. To a man, they either had no time for the hapless creature or dismissed it with bad advice. 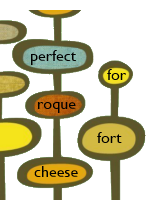 One brother, the lowliest of them all and with the most meagre prospects, took the time however to care for the hare and prepared and applied a poultice that soothed his raw skin and restore his fur. In gratitude, the hare reveals his true nature as a god and promises to elevate the youth who helped him with his kindness and ensured that he would be the one to wed the princess.